What skiers call “robin’s egg blue sky” shined high and dry in the mid-morning day outside of the kitchen window. A sharp-shinned hawk flew into my tiny backyard and perched on the foreclosed-on neighbor’s metal gate that serves as an entryway for the make-shift dog pen squeezed between our garages. A squirrel scratched at the ground a few feet below the hawk, seemingly unconcerned about the bird of prey. I stood in disbelief. The sharpie didn’t show any interest in the furry critter searching for a morsel to eat, an easy pounce that would have been a nice winter meal for the raptor. Adding to the disbelief, the squirrel soon jumped up onto the fence, landing a mere foot or two from hawk. “WTF,” ran through my head. I ran for the camera. The hawk hopped down the fence, his eyes fixated on the interior of the ornamental grass where the sparrows hide out when the hawks fly in. The squirrel kept an eye on the hawk. The hawk flew to a post nearby. It looked around for a minute or so, and then flew on top of the west-facing side of the garage roof. It stepped around a little and then flew down at the squirrel, talons out. 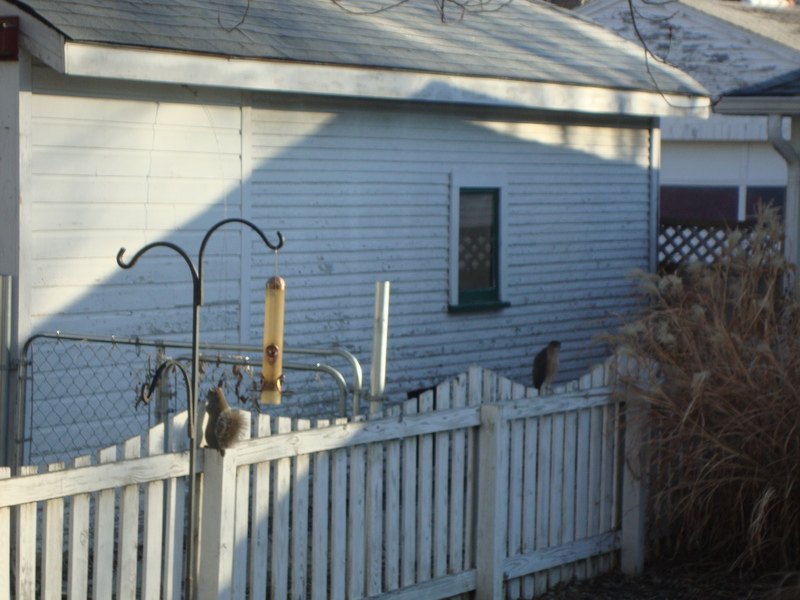 The squirrel dove down over the side of the fence, holding on and clasping to the cold wood. The hawk arched back up, flying over and sitting on the electrical wires in the alley. He then flew off into the robin’s egg blue sky. Those few minutes charged me up enough to decide that I would take a short ride today. I did. It was cold. A steady 10-15 mph wind that started somewhere out in the Great Plains kept me pedaling with vigor, both to keep the bike moving forward and to keep my body warm. An hour and fifteen minutes later, I was back in my warm home. I’ve said it before, and I’m saying it again: a mountain biker that also goes road riding makes a better mountain biker. Endurance. Spin. Speed.